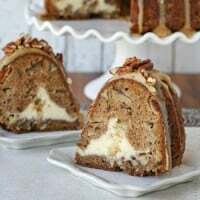 I love baking year round, but there is something extra special about baking in the fall! Cooler weather seems the perfect background for a warm oven and fragrant fall spices! 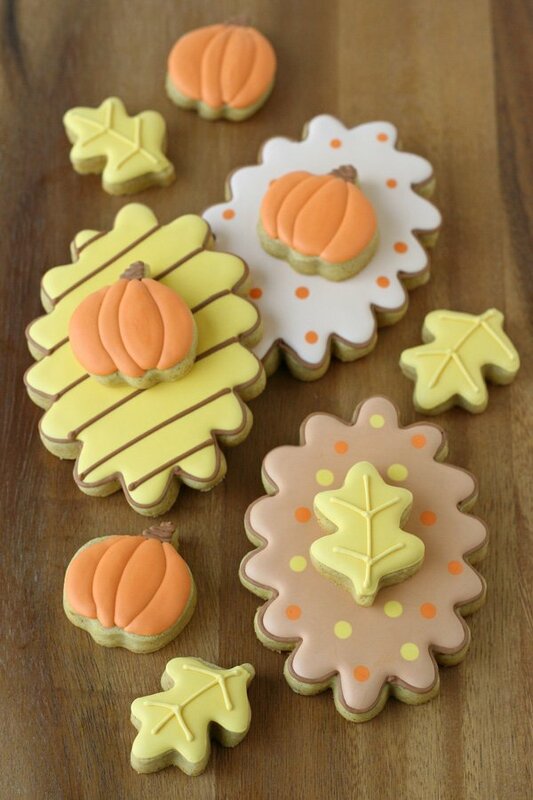 These double-decker fall decorated cookies are as delicious as they are beautiful! 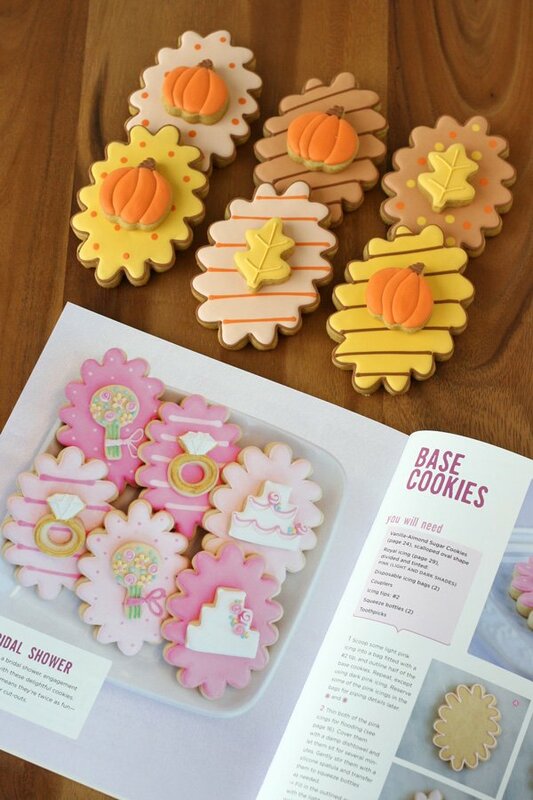 I started with my Pumpkin Spice Cutout Cookie Recipe and then took decorating inspiration from Decorating Cookies Party, a new book by the lovely Bridget of Bake at 350. 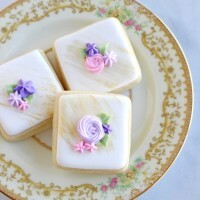 Bridget makes all kinds of cute cookies and treats on her site, and she has a super sweet personality to match! When I first looked through this pretty book I was drawn to some adorable double-decker wedding shower cookies (pictured below). 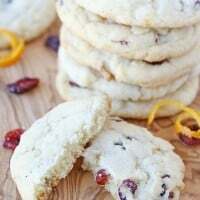 Bridget first popularized this fun double-decker cookie idea a couple years ago and it’s seriously brilliant! I mean what’s better than one cookie… two cookies of course! Although I love Bridget’s wedding shower design as is, I thought I could take the inspiration and turn it into something perfect for fall. I used the same base cutter, a scalloped oval, and used a simple mix of stripes and polka-dots for the background, just as Bridget did. 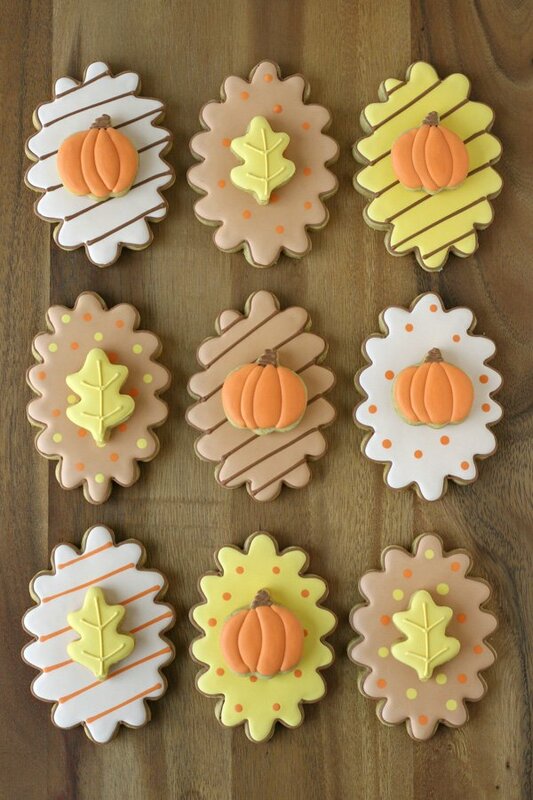 Then I added mini pumpkin and leaf cookies in place of the wedding themed cookies. I really love the way they turned out! Start with a batch of your favorite sugar cookie dough. I used my Pumpkin Spice Cookie Recipe, but feel free to use my basic Sugar Cookie Recipe. You’ll also need a batch of Royal Icing. For each cookie you can follow the step-by-step photos below. Mini pumpkins- Pipe stem with piping consistency, allow to set up. Add pumpkin segments that are not touching, using medium/flood consistency. Allow first segments to set up before adding final segments. Mini leaves- Outline (using a piping consistency), then immediately flood. Allow to dry, then add details, as pictured. Scalloped oval- Outline, then allow the outline to dry a bit. Flood with a contrasting color (if desired). Immediately add stripes or dots to the wet icing. Allow to dry before adding mini cookie (with a bit of icing). This general concept could be adjusted countless ways! 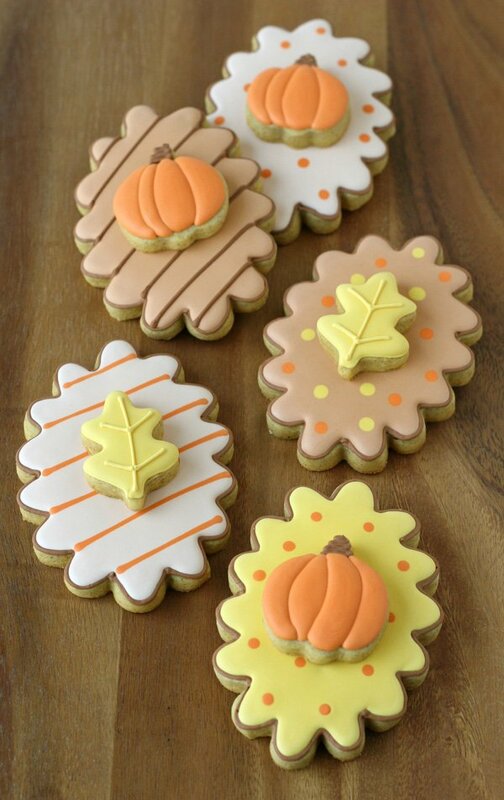 The addition mini cookies onto a larger base creates such a fun and unique treat! This design is just one of the beautiful and creative ideas in Decorating Cookies Party, which is currently available on Amazon for $10, what a steal!! And if you hop on over to Bake at 350, Bridget’s celebrating her book launch with an awesome giveaway (P.S. a KitchenAid Mixer is involved!!). As always these are just gorgeous! For some reason I think they look like they should taste like maple sugar! These are just precious! Thanks so much, Glory! I love seeing how the book gave you inspiration for these cuties!!! 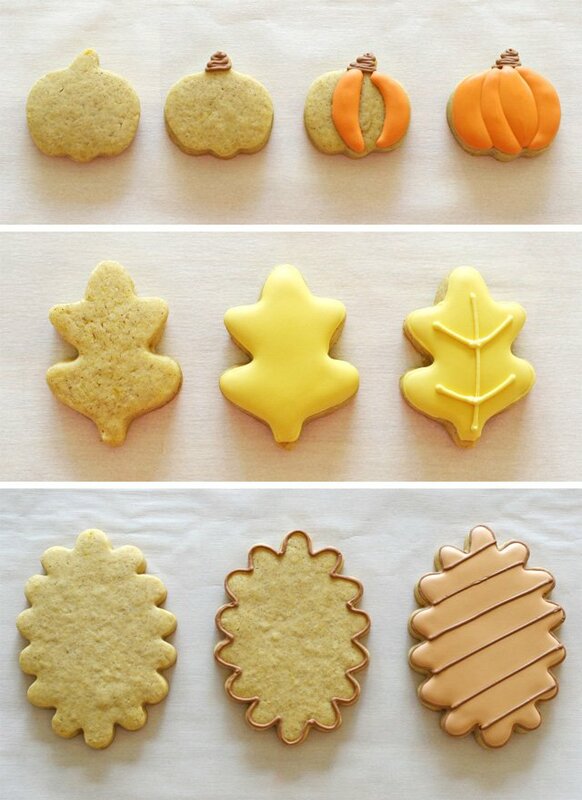 What beautiful cookies! You inspire me to improve my decorating skills! I would be so proud to serve these little beauties this Fall! Do please make separate posts for them as well… deal? These are absolutely beautiful and I imagine that they must taste delicious too. Autumn flavours – lovely! These are beyond adorable Glory! Glory, you’re the most talented cookie decorator I’ve ever met! I wish I could be a fly on your wall so I could watch and learn… Although that sounds a little creepy, so maybe I should just ask for a lesson instead. 😉 Pinned! 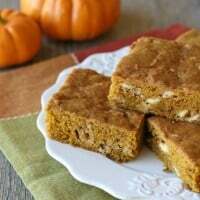 I just wanted to let you know that I have had great success with a lot of your recipes and the pumpkin spice cookies are no exception! Decided to try a pumpkin spice cookie from another source the other day and well…. fail. Then in a bit of a mad scramble I made your recipe and perfection!! Whoa! Love the colors and shapes, and I love Fall and these make me happy. These are so adorable and amazing! I love the dimensional look you get with the double decker-cookies! Thank you for sharing! I love these! You can’t go wrong with double the cookies! Love you! These cookies are ADORABLE!! So great meeting you this past weekend Glory!